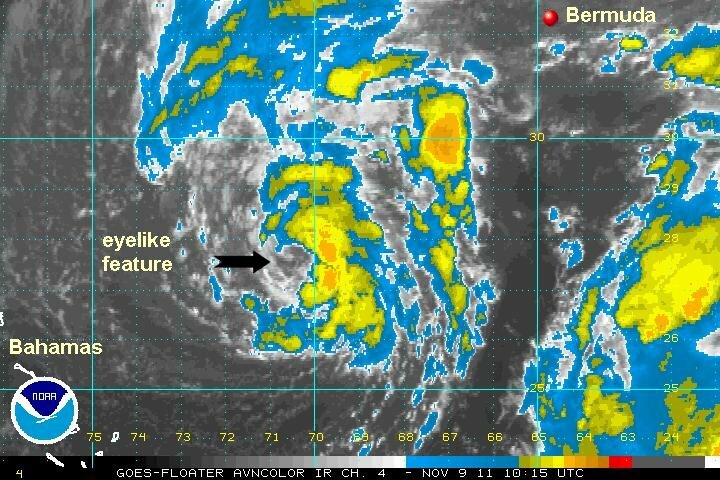 The low pressure area to the southwest of Bermuda has been forecast for several days now. It was apparent that a subtropical low had formed yesterday and should have upgraded at that time. The two following satellite pictures are from Monday afternoon and this morning. Granted that they are not both IR imagery, but there is little change in intensity over the past 12-18 hours. 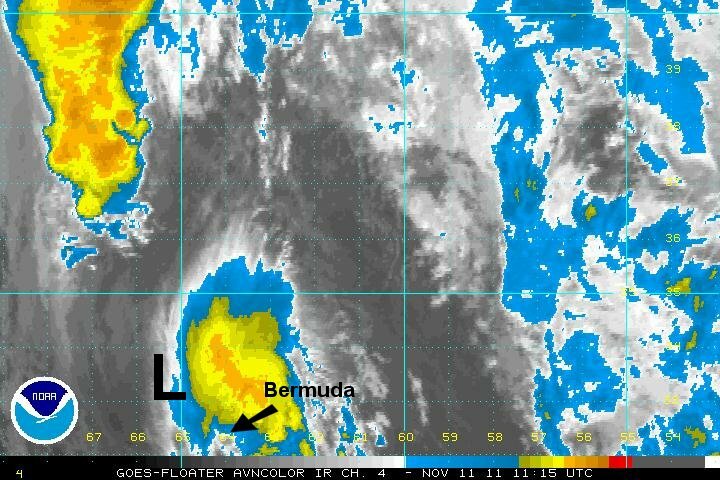 At 7 am est / 6 am ast Sean was centered near 27.2 N / 69.4 W or 445 sw of Bermuda. Top sustained winds are estimated at 45 mph (NHC 45 mph last advisory). Movement: stationary. Pressure estimated at 1002 mb. Forecasts take Sean north, then northeastward over the next few days. It will have a short life span as it is sheared by an approaching upper air trough and frontal system. 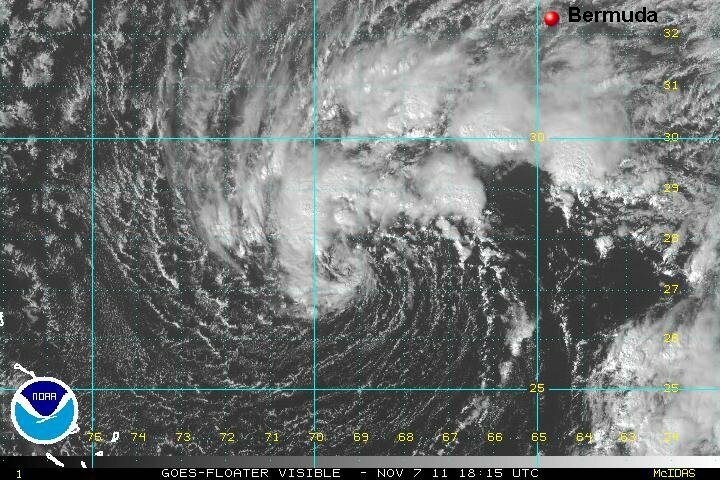 It will remain west / nw of Bermuda as it becomes extratropical. Sean is slightly stronger than yesterday and has only moved a short distance. Sean has made the transistion from subtropical to tropical as deep convection has formed near the center to circulation. Sean even has an eyelike feature. Bermdua has has steady winds from the east at 25-30 mph for at least the last 24 hours. Winds has increased to be near the top end of that range now. Tropical storm warnings are up for Bermuda and winds will likely gust in the 40+ mph range as Sean gradually weakens and becomes extratropical into Friday. NOAA estimates the seas with Sean near 20'. At 7 am est / 6 am ast Sean was centered near 27.9 N / 70.4 W or 450 sw of Bermuda. Top sustained winds are estimated at 50 mph (NHC 50 mph last advisory). Movement: west at 3 mph. Pressure estimated at 995 mb. Sean is again slightly better organized than yesterday. Deep convection has built around the center of circulation but has weakened some compared with a few hours ago. That is why I'm estimating a lower wind speed than the hurricane center. A primary feeder band is visible on the satellite imagery to the southeast of the low center. Upper air winds from the southwest will pick up soon shearing Sean. NHC officially makes Sean a hurricane later tonight. I'm thinking that Sean will remain a strong tropical storm. 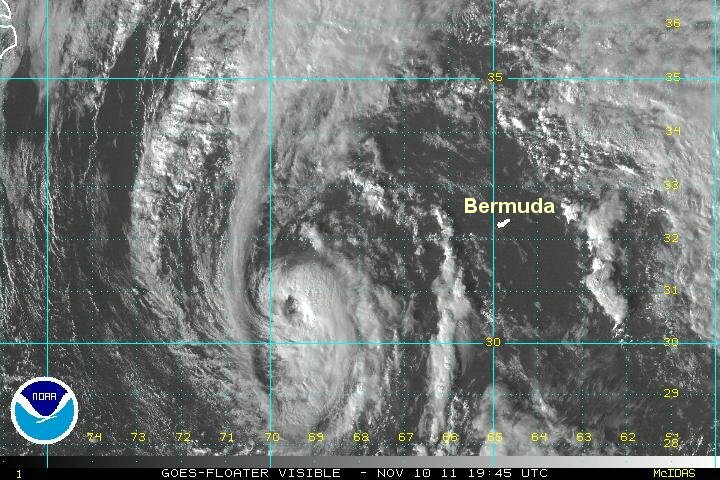 Bermuda's winds have actually calmed a bit. Winds are now in the 20-25 mph range. NOAA still predicts seas near 20 feet with the low. 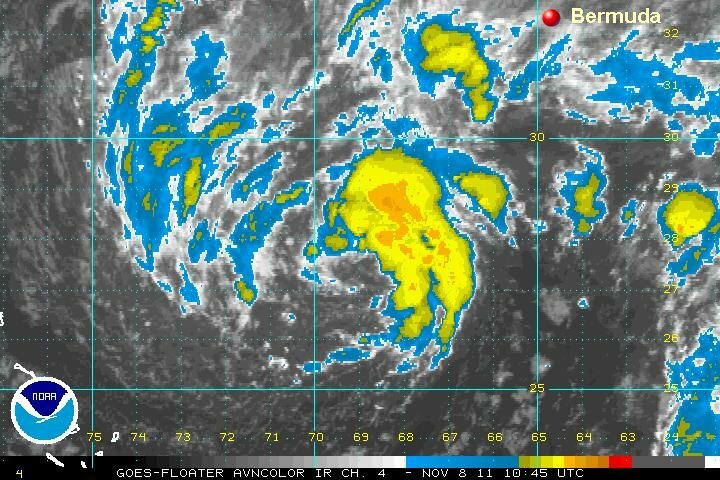 At 7 am est / 6 am ast Sean was centered near 30.3 N / 70.9 W or 380 miles sw of Bermuda. Top sustained winds are estimated at 60 mph (NHC 65 mph last advisory). Movement: north at 8 mph. Pressure estimated at 991 mb. Forecasts take Sean north, then northeastward over the next few days. It will be sheared by an approaching upper air trough and frontal system. Sean will remain nw of Bermuda as it becomes extratropical. It may briefly reach minimal hurricane strength during the next 12-24 hours. Sean is starting to get sheared and will not be a threat to strengthen. In fact, per the previous update, Sean will not becoome a hurricane and continue to weaken. 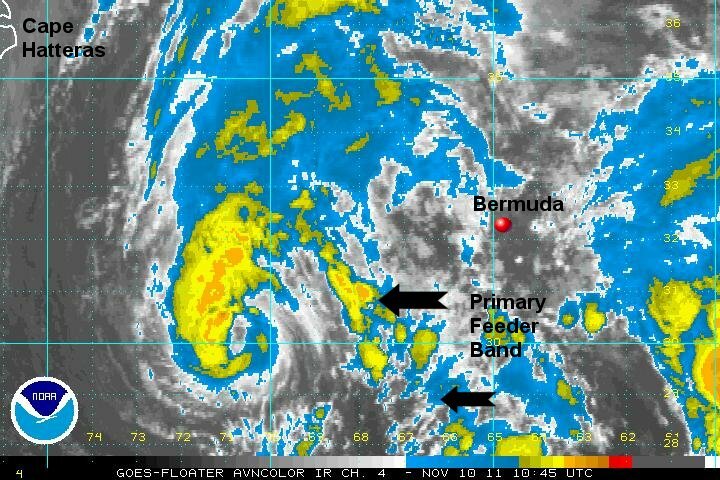 Bermuda is seeing winds near 30 mph and may see gusts 40-50 mph as it passes tomorrow am. 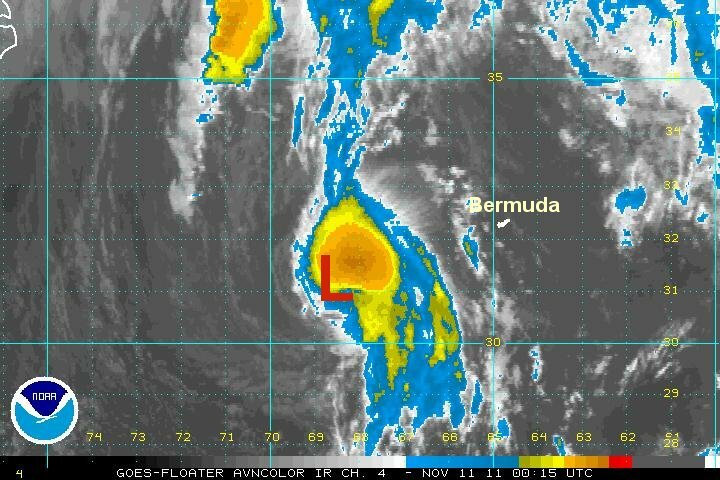 At 8 pm est / 7 pm ast Sean was centered near 31.0 N / 69.0 W or 265 milesw sw of Bermuda. Top sustained winds are estimated at 55 mph (NHC 65 mph last advisory). Movement: ene at 13 mph. Pressure estimated at 983 mb. Forecasts take Sean just northwest of Bermuda Friday morning then into the open northern north Atlantic as it gets sheared..
Sean is getting sheared badly. The heaviest rain is well east of the center and now away from Bermuda. Winds are sustained in the range of 30-35 mph with gusts to 45 mph. Conditions will gradually improve today as Sean moves into the north Atlantic. At 8 am est / 7 am ast Sean was centered near 33.4 N / 65.4 W or 80 miles nnw of Bermuda. Top sustained winds are estimated at 50 mph (NHC 60 mph last advisory). Movement: ene at 22 mph. Pressure estimated at 989 mb. Forecasts take Sean just into the open northern north Atlantic as it gets sheared today.